MOSCOW, February 8. /TASS/. The US-led coalition’s shelling of the Syrian militiamen proves that rather than fighting the Islamic State terror group (outlawed in Russia), Washington has been seizing Syria’s economic assets, the Russian Defense Ministry said in a statement on Thursday. "The recent incident once again shows that the United States’ illegal military presence in Syria is actually aimed at taking control of the country’s economic assets and not at fighting against the ISIL international terror group [the former name of the Islamic State - TASS]," the statement reads. 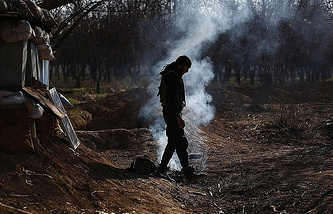 According to the Russian Defense Ministry, on February 7, "a pro-government militia unit, conducting surveillance and research activities near the al-Isba oil refinery (17 kilometers southeast of the Salhiyah settlement) to eliminate a militant group shelling the positions of government troops, was shelled with mortars and multiple-launch rocket systems." "The attack was followed by an air raid by the US-led coalition’s helicopters. As a result, 25 Syrian militiamen suffered wounds." The Russian Defense Ministry said that the reason for the incident was that the Syrian militia unit had failed to inform the Russian operational group in Salhiyah about its plans to conduct a surveillance and research operation. A number of media outlets reported earlier that Syrian pro-government forces had reached the Conoco gas field in the Deir ez-Zor province, which is considered to be the third largest in the country. Before the war broke out, the gas field produced two mln cubic meters of natural gas daily. The mostly Kurdish Syrian Democratic Forces took control of the area in October 2017. Apart from Conoco, the Kurds also seized the al-Omar and al-Tanak oil fields, believed to be the largest in Syria with a daily yield of 27,000 barrels of oil.